Two beautiful Requiems from two starkly different time periods, they share a calm and etherial atmosphere. The first, by Victoria, is a setting of the Office of the Dead written in 1603 (published in 1605) upon the death of Archduchess Maria of Austria, Holy Roman Empress, and wife of Maximilian II. It is considered one of choral music's great masterpieces, and in its steady progression, alternating the simplicity of plainchant with the intricacy of six part polyphony, it creates a sublime and hypnotic atmosphere of reverence. 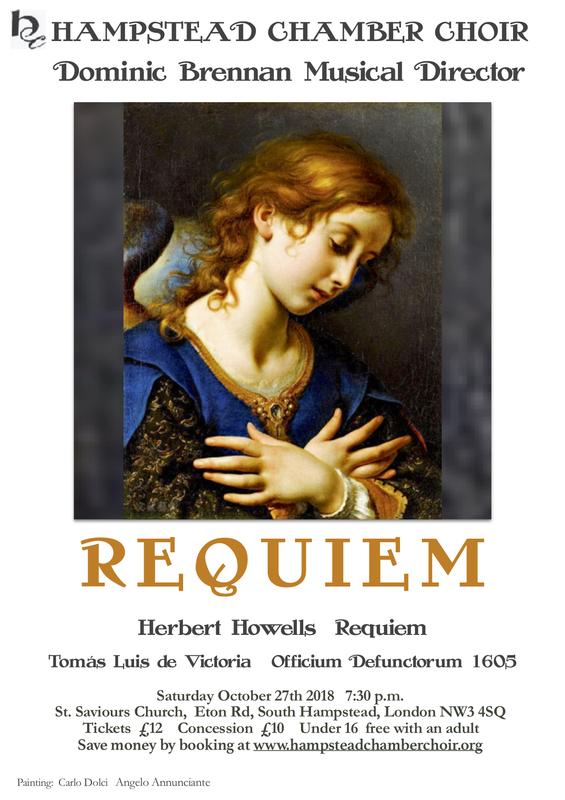 Howell's Requiem was composed, possibly as a response to the war, in 1932 or 1933 shortly before the death of his young son, and he used large parts of it in a later work, Hymnus Paradisi, written as a memorial to his son. Unpublished until 1980, it has already become one of the most beloved pieces in the choral repertoire. Again, the mood is deeply and quietly spiritual, but infused with comfort and hope: ‘et lux perpetua luceat eis' - ‘let light perpetual shine upon them'.